This final module brings together the learning from the Adaptation Inspiration Theme modules you have read in the last four weeks. The modules have presented recent cases in Africa addressing climate issues including, drought, flooding and sea-level rise. They have addressed issues through adaptation actions that can be described as community-based adaptation, ecosystem-based adaptation, partnership building, securing of energy and water resources, disaster risk reduction and finally emergency response. Module 4: Lesotho: Tackling water insecurity: an assessment of future national water management developed as part of the 2016 Lesotho Water Security and Climate Change Assessment. You can find more inspiration by downloading the FRACTAL Working Paper: 'Inspiring climate action in African cities' from the right-hand side of this page (if using a mobile device please see the bottom of this page). When you have completed the six modules the FRACTAL team would be grateful if you could complete the training survey - see the section below. This is the first of three FRACTAL training courses and your feedback will be used in the development of further learning themes. Lessons on the challenges facing African cities and potential approaches to addressing challenges have been collated from the four cases and enriched by further cases described in the Working Paper available in the right-hand column. The case studies underscore the challenges Africa’s cities and urban areas face due to the emergence and the increasingly adverse effects of climate change. The most important and imminent climate hazards facing the African continent are flooding, extreme temperatures, drought and sea level rise which add to ongoing pressures on cities. 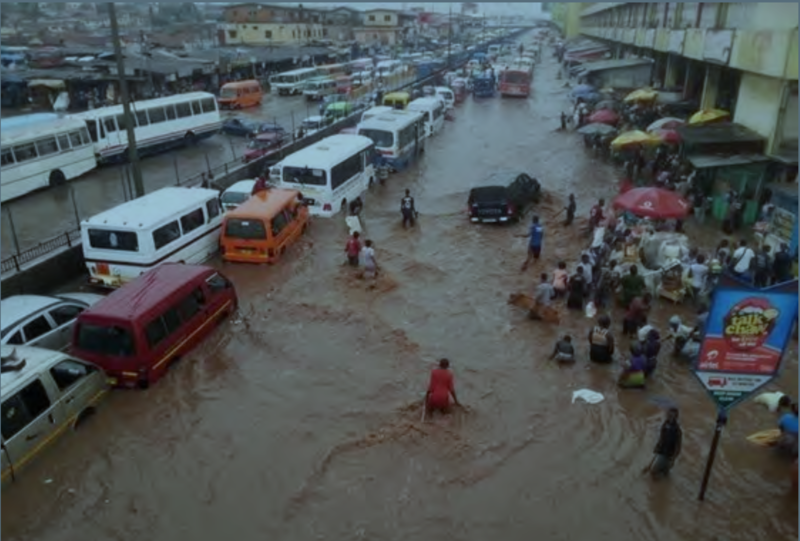 Alone, climate hazards such as flooding, drought or sea level rise pose severe threats to the integrity of African urban areas, the health of their citizens, and the safety and security of their surroundings. However, these hazards amplify the ongoing urban challenges of population growth, high rates of urbanisation; expansion of informal, unserviced settlements, and health concerns including the incidence of vector and waterborne diseases. Sectors increasingly compete for resources. This holds especially true for the water, energy and agricultural sectors. Water is essential to the production of nearly all types of energy (coal, geothermal, hydro, oil and gas, and nuclear power), but crop irrigation also constitutes a heavy user. Energy is the dominant cost factor in the provision of water and wastewater services (extracting and conveying water, treating water, distributing water, using water and collecting and treating wastewater). As a consequence, these three sectors, water, energy and agriculture are sensitive to change and subject to resource conflicts. Rapid population growth - and the lack of financial and institutional capacities to provide for urban housing and infrastructure - has led to sprawl and rapid expansion of ‘informal’ settlements in many urban areas. Sanitary infrastructure, sewerage systems and adequate waste management are seldom effectively regulated. The projects ‘Private-Public-People Networks for Climate Compatible Development in 'Maputo’ demonstrates how a lack of regulatory precautions and infrastructure negatively affect human health, water quality, flood risk and wildlife. In theory, institutions and governments provide the necessary structures and means to implement adaptation projects, and to enforce underlying mechanisms that are needed - be it on the local, regional or national level. However, in many African countries, policy instruments and legislative frameworks are still in development or in need of reform. Trust is an essential ingredient and an important precondition for the success of a project – particularly when stakeholders from many backgrounds and different perspectives create partnerships. A multi-stakeholder approach can be vital to building networks that are motivated by a common objective to reach a solution to a problem - as shown in the ‘Private-Public-People Networks for Climate Compatible Development in Maputo’ project. Through the use of participatory approaches (involving public, private and civil society actors), project managers are able to assemble all relevant and affected stakeholders to produce viable and holistic results. Diverse backgrounds and different views on project challenges help to ensure that actors comply with legislation, that projects fit into planning frameworks, and that technological solutions are properly installed and operative. A major challenge in African cities is the need for better coordination of projects and stakeholders. Despite an array of exemplar work, very little knowledge exchange takes place to allow model projects to learn from each other and scale across sectors and locations. The cases illustrate how improved coordination as a best adaptation practice in projects can unlock opportunities. It is, therefore, crucial to create links and synergies and to avoid duplicating research efforts wherever possible. Collaboration can add new perspectives to existing problems. Cross-sectoral collaboration is especially important in areas in which interests and policies conflict, and available resources are limited - such as are the case in the linked sectors of water, food and energy. In these areas, partnerships can help people to understand possible trade-offs and impacts of policies linked to climate change. This can help decision-makers and guide investments. ‘Tackling Water Insecurity in a Changing Climate in Lesotho’ offers an example of this. B.3. Engaging local communities early, include local knowledge in decisions and empowering communities and encouraging community ownership of actions. Adaptation to climate change is not only about changing actions but also about changing strategies. It often signals a new approach, involving both those affected by climate change, and the institutions responsible for mitigation and development in the city. At its best, the process involves a robust, all-inclusive response that promotes sustainable adaptation. Therefore, active community participation should be one of the main targets when implementing a project on the ground. This leads to longer-term success of projects. It also gives local people the opportunity to communicate their wishes (to municipalities, the private sector and/or the national government), and to contribute to strategic decisions during the project implementation. The best outcomes address specific needs of the people who are most affected by changing climate conditions, and who thus have the highest stake in the possible benefits of adaptation. Applying an 'Integrated Approach to Catchment Management in Cape Town’ restored and preserved biodiversity and ecosystems– and created local employment opportunities in the process. This not only benefitted the local environment but also local people. Such approaches can transform people’s perspective on their environment by making them aware of the benefits of protecting and sustainably using their own resources. Projects that are able to integrate public participation and job creation are also more likely to attract political support and international funding. Achieving a range of benefits through innovative approaches improves the chances of catalysed adaptation activities, and often helps to build resilience at the local level. Training and education on adaptation and mitigation activities can amplify the effects of participatory approaches. Projects that are coupled with training programmes and capacity building are often more effective, and they have longer-lasting impacts in improving environmental, social and economic conditions. Lusaka (Zambia) developed a city-wide disaster risk reduction strategy to confront the threats of flooding with a coordinated policy response. The case study provides examples of areas of possible intervention. African policy-makers, and national and regional development planning can fill many similar gaps. Policies and regulations on national and local levels are needed to ensure the long-term safety and sustainability of adaptation projects around Africa. It should be noted that institutions, regional governments and municipalities benefit from the enforcement mechanisms that legislation and policies provide in pushing for adaptation action. To take these steps, decision-makers need to understand the value of such activities. The 2030 Agenda on Sustainable Development (UN General Assembly, 2015) names climate change as 'one of the greatest challenges of our time' and that 'its adverse impacts undermine the ability of all countries to achieve sustainable development.' Associated targets of SDG13 'take urgent action to combat climate change and its impacts' focus on the integration of climate change measures into national policy, the improvement of education, awareness raising and institutional capacity on climate change mitigation, adaptation, impact reduction and early warnings. SDG11 'Make cities and human settlements inclusive, safe, resilient and sustainable' includes targets related to the implementation of policies to address mitigation, climate change adaptation and sustainable development and reduction in disaster-related deaths. Other goals that are addressed in these 4 cases are: SDG1 End poverty; SDG3 Ensure healthy lives and promote well being; SDG6 water and sanitation for all; SDG7 sustainable and modern energy for all; SDG 8 promote sustainable economic growth; SDG9 build resilient infrastructure; SDG 15 promote sustainable use of terrestrial ecosystems. Climate information has been used in some cases but not all. Where data has been used there is the opportunity to make decisions based on possible future conditions. Starting with current climate concerns and observed changes is the best starting point. Uncertainties and gaps in information can be conveyed to the community, and the climate information related to specific impacts at the local scale and the community’s previous experiences. If climate data is available in a suitable format to be used by cities and communities it can be very helpful particularly in situations where decisions are being made across several sectors or those that affect several municipal departments and that are costly and have considerable long-term impacts e.g. building dams, changes in land use. A reminder if you have not already done so, head over to the survey available here. This is the first of three FRACTAL training courses and your feedback will be used in the development of further learning themes. Please register on weADAPT and then add your own case study directly, or with our support, so that we can expand our 'Inspiring Adaptation Cases'. Your case can be urban or rural and it would be excellent if it is related to an African city or urban region but not essential! Your case will be looked at by one of the website editors and published after any necessary clarification with you. The cases will be added to the FRACTAL Inspiring Climate Action in African Cities book and contribute to the body of cases available to inspire others.